What is Self Doubt? How to overcome it? There are times when a person is full of doubt. Unable to fathom the sown seeds, the person starts to hesitate, fear, and fails to reflect upon his thought processes. He starts worrying beyond apprehensions. It starts affecting his daily life and takes a toll on his social and professional performances. The person slowly witnesses himself loose into the drowsiness called self-doubt. So what is self-doubt and why does it creep into our lives and destroys our motivation? What can be done to overcome the seeds of doubt? 1. What is ‘Self Doubt’? It is that phase of life when you are unsure of what you want to achieve. You are hesitant in your approach. An excuse to not commit to anything. We are usually full of doubt when we lack confidence. It maybe because of lack of will, lack of skill or because of our halfhearted takes towards an objective. It can also be a prolonged period of influence. You might have been involved in a group which has a depletive take on your process of thought. The process is also a direct outcome of a bad health. Lack of sleep and lack of motivation can impact your thinking process. It can bring out your negative side with a negative thinking. This, in fact, affects your way of life. 2. When is a person inflicted with it? When a person is aware of his abilities, he strives to reach his goal and work hard. No matter how many times he fails, he continues to work. This stands true for career and social objectives. When the same scenario befalls a doubtful mind it tends to fail. This, I guess is one of the root causes. 3. Doubt is not always caused by lacking confidence or absence of spirit; it can be vice a versa. Can a doubting mind take prudent decisions? I doubt myself that’s why I lack confidence or lacking confidence causes self-doubt. I doubt myself because I feel lonely or I doubt myself that’s why I feel lonely. I don’t believe in sharing things with people or I don’t share things with people that is why they don’t believe in me. I don’t socialize because I fail or I fail because I don’t socialize. A confused or hesitating mind cannot differentiate white from black or black from white. People have a common tendency and a greedy nature. Everyone goes through a difficult patch. They try numerous times and are hit hard. Yet, not everyone goes on a rant. When faced with a dearth task they tend to rise. Every youngster is taught to be ethical, but success demands something else (success here can denote social objectives). We call upon ourselves and are the one to face it. Either way, we need to comprehend our potential and make use of it. We need to utilise our failures in a positive way. 4. What can be done to deal with ‘Self Doubt’? Just go for it: Thinking too much may have its own consequences. You may not know something until you try it. If you have an idea, then go for it. Give it your all. You can’t run unless you learn to walk & you can’t walk unless you learn to stand first’. Avail Alternatives: Availing alternatives will not do any harm. If your platform A’ doesn’t deliver the goods, its time to move to Platform B. You can’t weigh on a single resource. Patience is good but it needs to be aimed. A friend may not respond, try for another. Life has a strange pattern; you may never know what may click next. Infinite patience: Patience is the key to everything. You cannot expect spontaneous results. Things take time. You never lose, you always gain something. Your project A failed, but you gained experience. Experience, valuable enough to implement Project B.
Don’t be afraid: The major cause of setbacks and doubts is the inability to start. Every human is afraid to start or take a step. A baby is afraid to walk but learns to step. Start slowly; take a deep breath and one step at a time. Fight or Flight: Life doesn’t bring things easy. Even a child born with silver spoon in his mouth needs to fight for it. A prime minister’s son doesn’t make him the next candidate, and if it does he still needs to work for it. It’s easy to criticise but difficult to execute. You need to understand when to fight and when to stall. A victor is one who fights and stalls at the right time. Don’t guess: Making unnecessary guesses makes things difficult. You may analyse a situation and determine possibilities but that is different from making wild guesses. There is always a thin line between analysing situations and making a guess work. There are times when people mistake it for intuition. Release your adrenaline: Whenever in a stress, release adrenaline. Working out helps a person and keeps the mind occupied. Remember, an empty mind is a Devil’s workshop. Don’t be a judge: I called him/her and he/she doesn’t call me back. It maybe your everyday life situation, a private or professional affair. But it doesn’t let you judge a person. Everyone has a different life that they may get busy with. You expected attention from a person while you neglected the other who was busy reaching you. We humans are weird species; we complain for what’s not ours but neglect what we have.Stop judging people. You can always observe not judge. There’s always two side to a coin and three facades to a story: yours, mine and the truth. 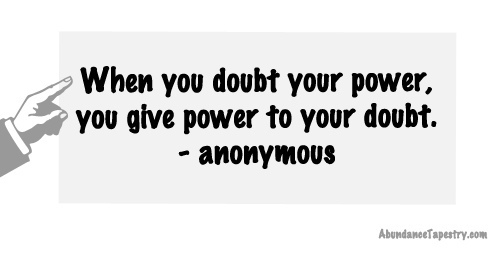 When do you feel doubtful, and how do you tackle your doubts? Provide your response in comments. The self doubt indeed brings in anxiety. That it does. It also affects our confidence. thanks for the great pep talk! My pleasure. I am glad that this old post was of some help. Thank you for your generous review. will try my best to improve upon it. Very good attempt to understand self doubt… not only of why and how but also how it can be dealt… keep writing….